Shelley Bean: Birthday Blog Hop! Have a Hoggy Birthday! Hello and welcome here from the fun blog stop at DD's blog. If you want to start all the way at the beginning of this VERY large and exciting hop you can go all the way back to Meighan's Blog. Have a Hoggy Birthday...well, Ground "hog" Day anyway. Yes, February 2nd has now come and gone this very week, and many would not perhaps consider it a worthy holiday for Birthday wishes. But, this day happens to my son Jordan's birthday. He was kind enough to his mom on February 2nd back in 1990 not to try to climb back in after he saw his shadow! (thank you son!) My boy is now officially a man! He turned 21 and so I decided to get creative with my cricut and whip out a cute little card to send to him. I of course had to give my Create a Critter cartridge some use. I couldn't find an actual groundhog but decided the hedgehog was fairly close....it has "hog" in it's name. Right? "I like to see a man of advancing years throwing caution to the wind. It's inspiring in a way." But, in the end I decided to put the funny on the inside. ﻿﻿﻿﻿And so, there you have it. It's simple and sweet as things usually are when made with the cricut and that's the beauty of it. I hope you enjoy this and the other posts. There is still a lot more to see so please check out the next stop along this birthday hop with Melanie. But wait...that's not all! What's a birthday hop without some birthday presents? I am going to give away one of my digi-stamps to 5 lucky (albeit random) visitors. All you have to do is leave a comment below and become a follower at my blog (if you aren't already) and I will let random generator choose 5 winners of the digi-stamp below. This is original and drawn by me, and just in time for your Valentine's crafting. Here is the full line-up of all the blogs on this hop. Have a blast! I know I am! 25. Shelley - http://heartstring-designs.blogspot.com/ THAT'S ME! What a cute, cute card and I love the 10 reasons. This is such a cute card! I love the top ten list it is so cute! I am a follower! I hope you have a fabulous day filled with lots of glitter! AHHHH his is the day after mine! 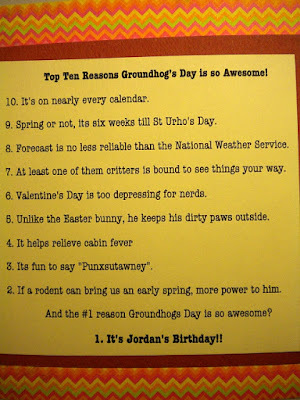 Great ground hog day card! I love seeing everyone's holiday! Love the top ten list sentiment. or you can find me on facebook! love this and i totaly scraplifted you 10 reasons....cause GROUNDHOGS day is my brithday as well...and it is hard to find stuff.,...TFS!!!! What a great Card. Love your ideas. I love that critter!! Great card! Thanks for sharing. I am already a follower. Yes, yes... "hog" gets it done! HYSTERICAL!!! So great! that is a super cute card!! happy birthday to your son! thanks a lot for sharing! 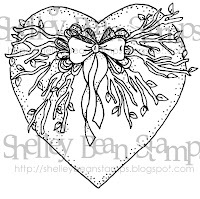 Super cute card, and I would love to win that beautiful digi stamp! 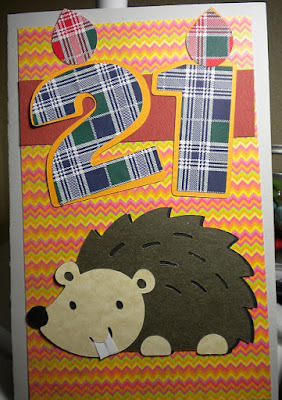 Best card so far and best BDAY - I am also a groundhog baby - Just not 21 anymore - I graduated the year your baby was born. Great work! - I am a follower. This is a really cute card, and I'm with you - groundhog/hedgehog ... what's the diff! LOL I'm a new follower, and I LOVE your digistamp. I so wish I could draw! Super cute card! Love the lit hedgehog. Great idea for putting down all the reasons too! Having a giveaway on my blog! Come check it out! This is a cute card!! I really like it! Love your card..the top ten list was awesome. So cute!!! And funny. Love it. Love seeing projects with carts that I already own. Thanks for sharing! Cute card, ground hog day was the day I graduated miderm from High school many years ago. Cute card - glad you used a hedgehog - they are so much cuter than groundhogs :) I am a new follower - love what I have seen so far! Such a cute card! I have yet to use my Create a Critter cart - can't wait. I just got it in the mail. What a cute card for a very special day, love the 10 reason idea!! ~ Great card. I love the 10 reasons!! ~ I'm a new Follower of your Blog! What a cute card!!! :) I'm sure your son had a good laugh! Really cute card! great saying! Love your card. So cute. Thanks for the hop and giveaway! This card is really cute and that hedgehog does look a bit like a groundhog, doesn't he? LOL I'm a new follower having just found your blog on this hop. I'm glad I did as I can tell from your minis in the following post that I'm going to like what I find here. Your digi stamp is lovely and I hope to be one of the lucky winners of it. NO this is too adorable! LOVE IT!! Love your "groundhog", he is so cute! 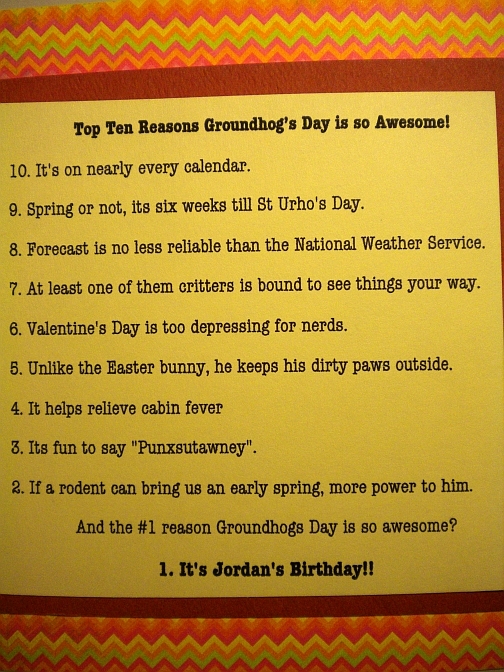 And totally agree with # 8 on the list that the groundhog is just as predictable as the weather people that are paid for their job, lol. Good list. I keep forgeting to add it.